deflection supposed to result in own goals.. . dang!!! My my this is exciting. Everyone says British players are overrated, but Balotelli is the most overrated player on the planet. All potential, no consistency. Blasting balls like that isn't that impressive. England look like Liverpool, dangerous on the counter. Italy are living on the edge here, but they're managing the game well. England need to make the most of this impressive start before their lungs start to burn in the second half. Sterling has too much pace for Italy to handle, and he wins another free kick here. England look like Liverpool - AWESOME!! Liverland looking good. Much better than previous iterations. haha, sturridge gets himself in goal. get the BALL in the Goal. if Europeans have such trouble with humidity, the Americans are going have a chance against portugal. this is normal where we come from. 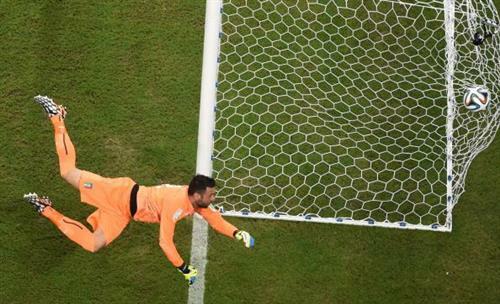 Shot by Antonio Candreva... but it's well wide of Joe Hart's right-hand post. is England this good or Italy just happens to be over-rated? This game has been so eventful at times we can't even keep up in here. anyone know what the weather is in Manaus? There appears to be some tension in the England ranks regarding Rooney and his failure to cover Baines. Both Baines and Gerrard appeared to exchange words with him there. It's hot, Gary. Very hot. I told you this would be a borefest !! Italy is 1-9 (11.1%) on passes into the box... Their 2010 World Cup average was 24.8% on those passes. Take Rooney off and throw on Ox or Barkley. The pace will completely devastate an obviously slow Italian team. It's still 85F, 64% humidity in Manaus today. Will there be more games in Manaus?